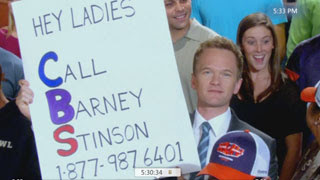 The highlight of last night's Superbowl was seeing Barney Stinson holding up his Date Soliciting number! I started calling and after a few busy signals (there's a sound we all expected to be extinct by now!) got through!!!! THEN I found the sound file on YouTube.Com but there's no telling how long it will be up so click fast! I can't wait to meet you. (voice gets soft and serious) I love you." So anyway I kept trying to call back and even *66'ed (continue dialing a busy number until it rings) but no dice. Luckily I have access to the internet so I know everyone else got the same recording. ****ALSO my friend sez Barney's sign was twice as AWESOME because Call Barney Stinson stresses CBS's call letters and tv crews will typically zoom in on and photograph people with signs featuring their call letters. Legen----hope you're not lactose intolerant because the last part of that word is-----dary! That is highlarious! I missed that...sniff. Love Neil Patrick Harris.